The warning has an orange range for regions of the western part of the country. Yesterday the Senamhi anticipated the entrance of a cold front to the provinces of Chuquisaca and Tarija. The National Service of Meteorology and Hydrology (Senamhi) issued a red alert for strong winds in the department of Santa Cruz. The natural phenomenon will take place from this Friday and will extend until Monday. The data indicate that the air currents will reach speeds ranging from 70 to 100 kilometers per hour, affecting the provinces of Ichilo, Ibañez, Cordillera, Warnes, Florida, Sara and Santiesteban. An orange-rated warning was also issued for the departments of the west, La Paz, Oruro and Potosí, with gusts of 30 to 89 kilometers per hour, taking place between Saturday and Monday. 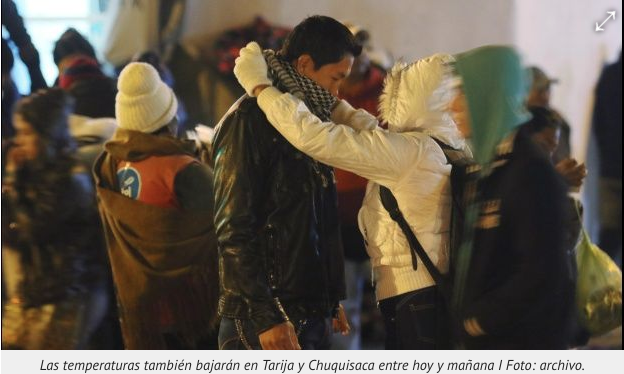 Yesterday, an orange alert was issued for provinces of the departments of Tarija and Chuquisaca for the entry of a cold front that could cause frosts between today and tomorrow. The warning states that “there is a significant level of threat”, as it is “a natural phenomenon not habitual and with a very high level of danger for the usual activities of the human being”. This entry was posted in Bolivia, Environment, Health, Santa Cruz and tagged climate change. Bookmark the permalink.